Middle School Science with Vernier #10: What Causes the Seasons? Because the axis of the Earth is tilted, the Earth receives different amounts of solar radiation at different times of the year. The amount of solar radiation received by the Earth or another planet is called insolation. The tilt of the axis produces the seasons. 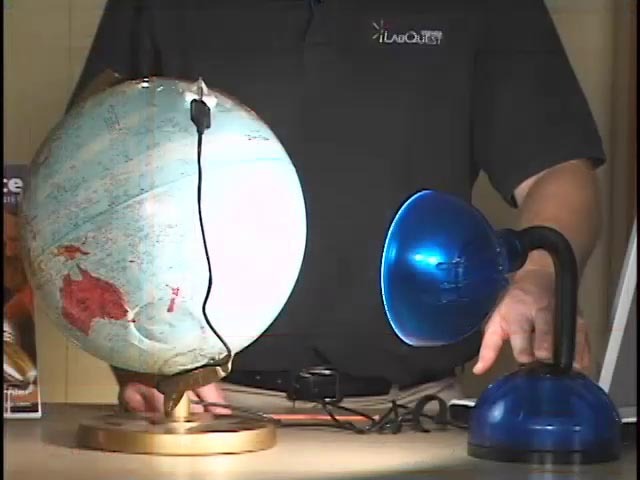 In this experiment, a simulated sun—a light bulb—will shine on a Temperature Probe attached to a globe. You will study how the tilt of the globe influences warming caused by the lighted bulb. Monitor simulated warming of your city by the sun in the winter. Monitor simulated warming of your city by the sun in the summer.